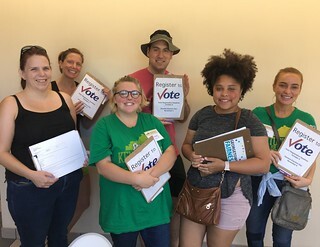 Members get ready to canvass in Oakbrook! Back Row: Greta Elenbaas, Jason Worms, Megan Pfeffer. Front Row: Jen Scott, Kimmy Sandlin, Janiah Miller. Photo taken by organizer. Please credit Kentuckians For The Commownealth.